SPARSE column is ordinary type column that has an optimized storage for NULL values. A SPARSE column is an ordinary type of column that has optimized storage for NULL values. It also reduces the space requirements for null values at the cost of more overhead to retrieve non-null values. In other words, a SPARSE column is better at managing NULL and ZERO values in SQL Server. It does not occupy any space in the database. Using a SPARSE column we may save up to 20 to 40 percent of space. We can define a column as a SPARSE column using the CREATE TABLE or ALTER TABLE statements. We may also add / change a column from graphical view. In this example I have create two tables with the same number of columns and the same data type but one table's columns are created as a SPARSE column. Each table contains 500+ rows. Using the sp_spaceused stored procedure we can determine the space occupied by the table data. 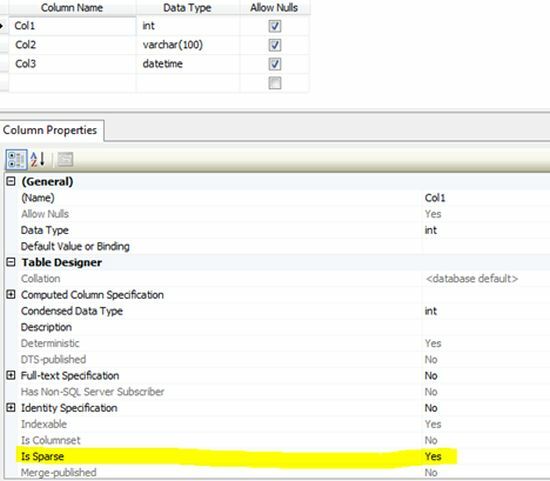 A SPARSE column saves database space when there is zero or null values in the database. INSERT, UPDATE, and DELETE statements can reference the SPARSE columns by name. We can get more benefit of Filtered indexes on a SPARSE column. We can use SPARSE columns with change tracking and change data capture. A SPARSE column must be nullable and cannot have the ROWGUIDCOL or IDENTITY properties. A SPARSE column cannot be data types like text, ntext, image, timestamp, user-defined data type, geometry, or geography. It cannot have a default value and bounded-to rule. A SPARSE column cannot be part of a clustered index or a unique primary key index and partition key of a clustered index or heap. Merge replication does not support SPARSE columns. The SPARSE property of a column is not preserved when the table is copied. SPARSE column is a good feature of SQL Server. It helps us to reduce the space requirements for null values. Using a SPARSE column we may save up to 20 to 40 percent of space.